Office attire may be strictly business, but every now and then, we need to let loose and let our personalities show. A subtle way to make a statement is through a fun assortment of dress socks. Show off some splashy colors, get a little playful with patterns, or pay homage to your favorite hobby—all while displaying some very fancy footwork. 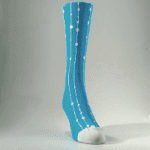 It’d be hard for anyone to miss you with these electric blue socks. Make sure you’re seen around the office. One size fits most. From Dan Ryan, Hilltop, Virginia Beach. 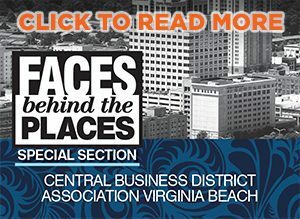 757-425-0660. $40. The color purple is commonly associated with power and ambition. Wear this pair to your next business meeting to make a real statement. It’s game day. 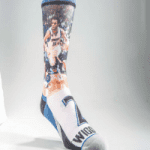 Let your socks do all the talking while you sport your team spirit to your officemates. Price range: $10–$18. Found at local surf shops and online. Are you working in the digital sphere? 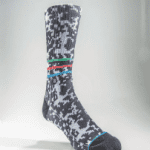 These pixilated camouflage socks will help you blend in–or stand out. 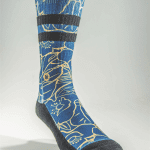 These eye-catching socks are adorned in tropical flowers against a sea of rich blue. 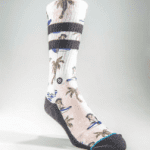 If you’re not due for a vacation, with these socks, at least you can dream of one. Summer might be over, but you can still show you beach love by monkeyin’ around in these comical threads. Is Monday your version of the Day of the Dead (tired)? 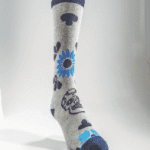 Pull on these sugarskull inspired socks and sweeten your day’s style.